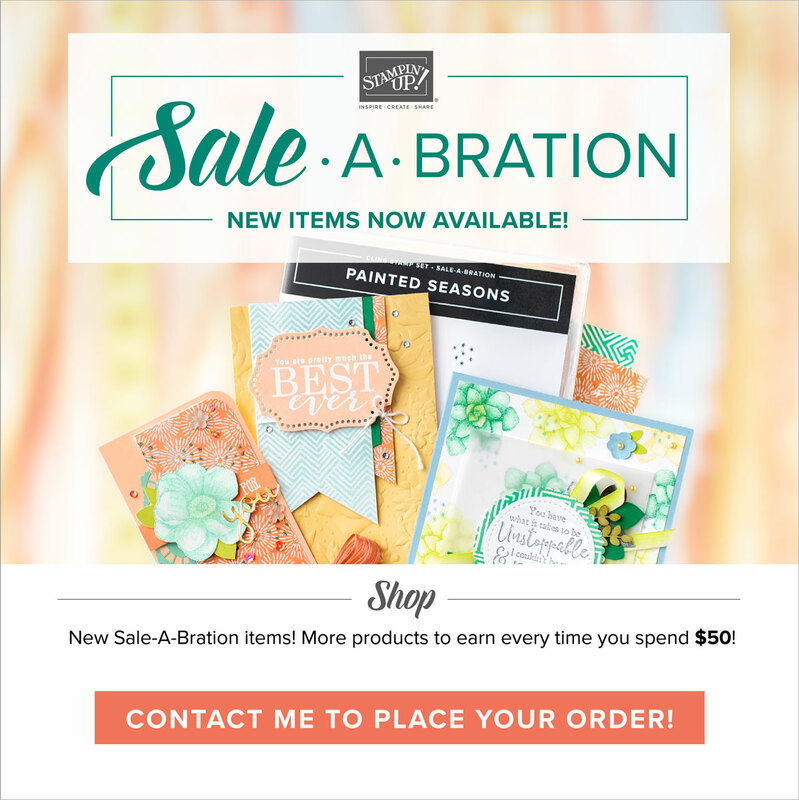 Spend: During Sale-A-bration you can earn a FREE product for every $50 US/$60 CAN you spend- that includes exclusive Sale-a-abration products, as well as over 80 stamp sets from the Idea Book & Catalog. Host: When you host a workshop during Sale-A-abration, not only do you receive the regular hostess benefits (which are already great), but you get an additional FREE Sale-A-abration product for every $300 US/$395 CAN in workshop sales. Would love to hear from you. Many blessings!! Have you been thinking babies lately? Well, I have! 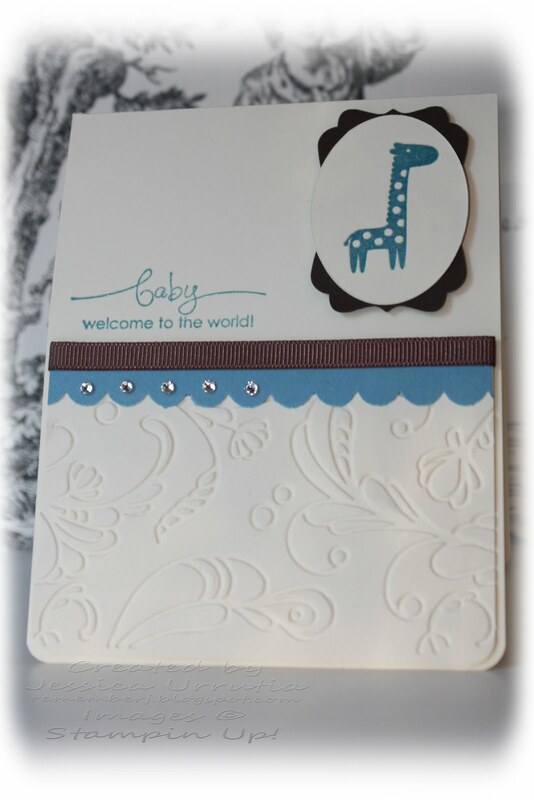 Im pregnant with a baby boy so I've just been into baby stuff and since giraffes are my favorite nursery animal here goes my first "Welcome Baby" card. 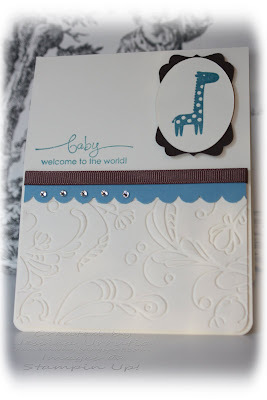 :-) I enjoyed doing some heat embossing on my giraffe and sentiment. I stamp my giraffe on Marina Mist with the help of my Stamp-a-magig, then stamp it again with Versamark (right on top). Pour some Clear embossing powder and heat with my heat gun. Same process for the sentiment. Cute!! I also used the debossed side of my Elegant Lines template to give it a nice twist. Hope you get inspired to make some of your own and celebrate how wonderful it is to bring life into this world and thank God for all His goodness. This is a beautiful day! Enjoy it! You are special. 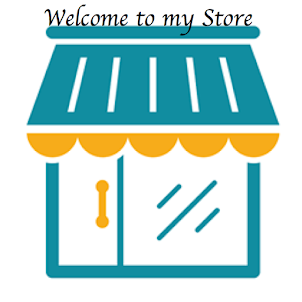 Accesories: Decorative Label Punch, Chocolate Chip ribbon, Basic Rhinestones, Elegant Lines embossing Folder, Scallop Border Punch, Clear embossing powder, Heat gun, Oval template (non SU). Hi my dear friends, tx for visiting!! 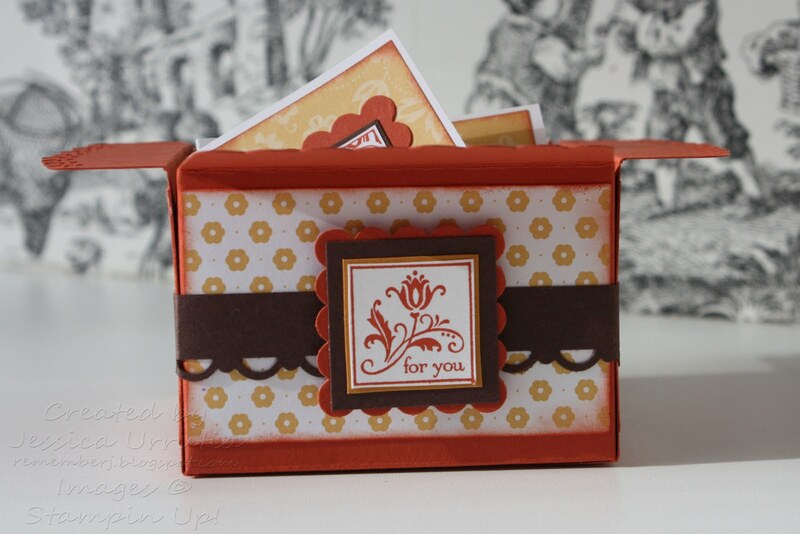 This card was inspired by another demo, Susan Copp. 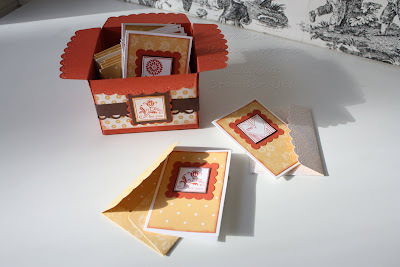 I changed a few things but the cool idea of punching the center of the Medallion Stamp with the scallop circle punch was hers and is great! 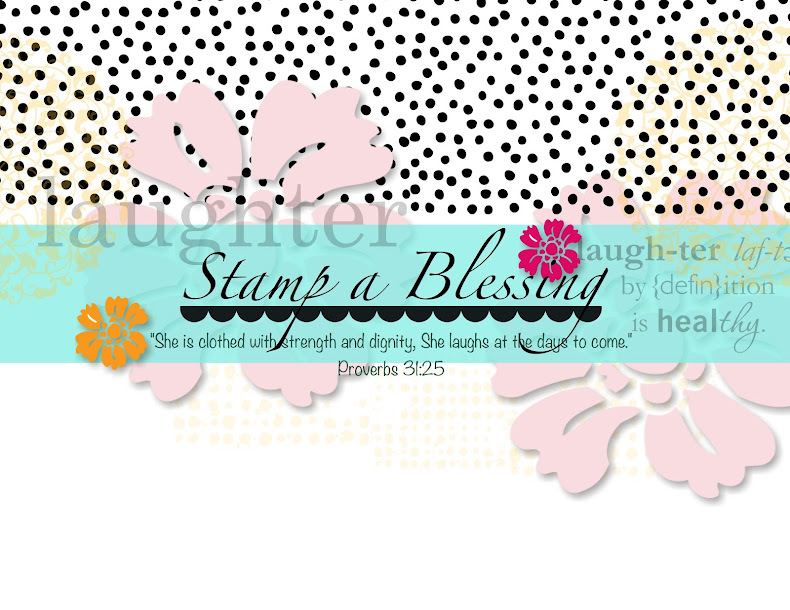 This background stamp is soo versatile. 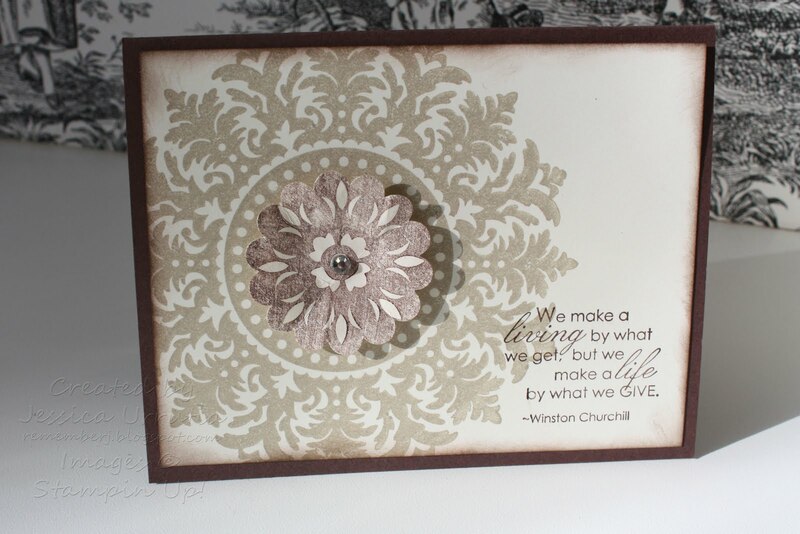 The sentiments comes from Occasional Quotes, one ofthe hostess stamp sets. I enjoy sharing different ideas with you, hope you get creativeand take some time to stop and relax. Life can be hectic!! Have a honey of a day!! 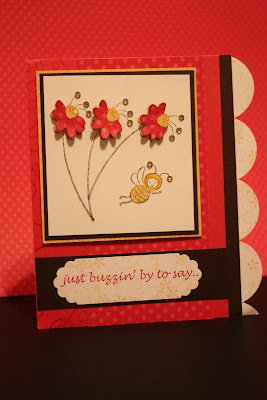 This week I wanted to try something different with the JUST BUZZIN BY stamp set. I try paper piecing. I stamp on different color designer series paper and cut them, then glue on top with a glue stick (first layer, so saffron) and dimensionals (second layer, melon mambo). I then embellish with some of SU rhinestones. Isnt it pretty. Just to bright someone else's life. 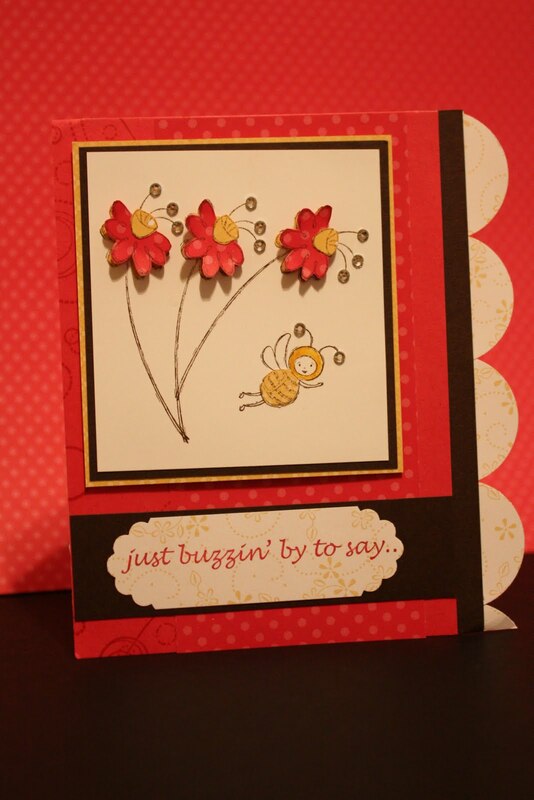 The sentiment inside reads "have a honey of a day". Hope you enjoy and try this ideas. Leave me your love with your comments. I would love to hear from you. 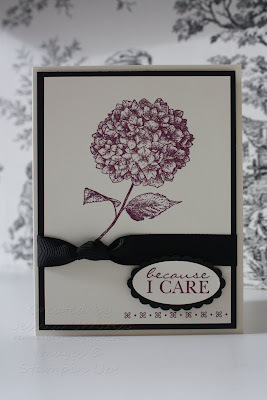 BECAUSE I CARE is one of the beautiful Hostess Stamp sets offered in the Idea Book from Stampin Up. I believe the flower image is a classy way of sharing a sentiment with someone you care about. This card was made for a friend after a hard time. Stamps help us express in ways that sometimes we dont know how to talk about. May you always be blessed with opportunities to share the love of God one way or another. Leave me your love with your comments. I would love to hear from you. Blessings! Happy New Year my dear friends! To start the year I chose to share with you one of my favorite projects. 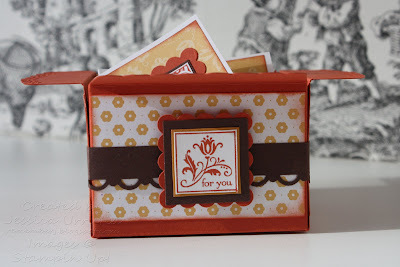 This little box was created with the Scallop Envelope Die from SU. 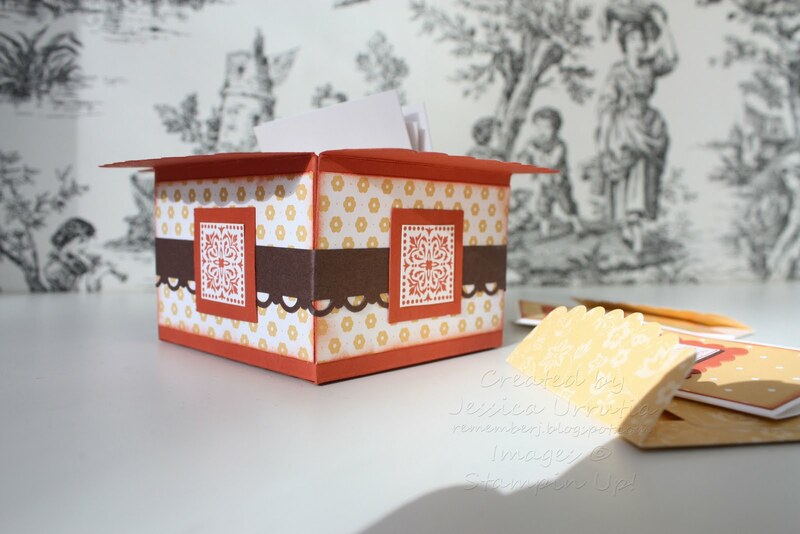 I glue together 4 envelopes to create the box. I then proceeed to make a few small cards that fit the envelopes to place inside the box. 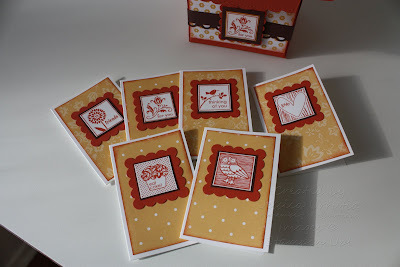 Stamp set used was Cute bythe Inch. I totally enjoy this stamp. Hope you do to. Email me if you have any questions. I plan to keep posting some of my new creations this week while I decide what to get from the New Mini Catalog, our Occasions Catalog. It's almost here!! !